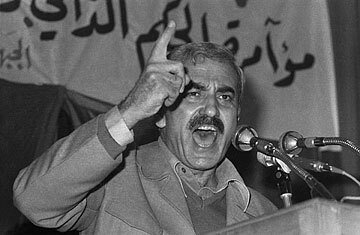 You could call George Habash, a Palestinian leader who died in Amman on Saturday at the age of 82, the godfather of Middle East terrorism. If you assumed that Palestinian or Arab extremism somehow sprung entirely from Islam  from the puritanical Wahabbi intolerance and so forth  take a close look at Habash's first name. He was a Greek Orthodox Christian, who sang in his church choir as a boy back in the Palestinian town of Lydda. Habash's life tells us a lot about the long Israeli-Palestinian conflict, which seems as intractable as ever, and prompts reflection on the Middle East's seemingly unstoppable whirlwind of violence. Habash's group, the Popular Front for the Liberation of Palestine (PFLP), pioneered the hijacking of airplanes as a Middle East terror tactic  one eventually employed by the al-Qaeda hijackers on 9/11  way back in 1968 when three PFLP armed operatives commandeered an Israeli El Al airliner enroute from Rome to Tel Aviv. Checking in for a flight has never been the same since. Many PFLP operations remain etched into history as some of the most infamous acts of terrorism. In 1970, PFLP terrorists hijacked four airliners at one time, flew three of them to Jordan, blew them up, and triggered the Black September civil war between Jordan's Hashemite monarchy and Palestinian guerrillas. In 1972, Japanese Red Army terrorists working with the PFLP massacred 24 people at Israel's Lod International Airport (now called Ben Gurion International Airport). In 1976, the PFLP's last hijacking ended in the daring rescue by Israeli counter-terrorism commandos in Entebbe, Uganda. By then, the actions of Habash's small but radical faction had propelled the Middle East into cycles of violence that were ever more extreme. They have yet to subside. Besides multiplying in number and intensity, Palestinian terrorism prompted reciprocal Israeli counter-attacks on neighboring countries that in some instances led to the outbreak of war. But compared to the terrorists behind today's nihilistic suicide bombings and mass atrocities such as 9/11, Habash's commandos were almost softies. Before they blew up the three planes in Jordan in a spectacular, televised moment that was the 9/11 of its day, all of the 300 or so passengers were evacuated and quickly freed. To what exact extent Habash inspired the likes of Osama bin Laden is a matter of conjecture. While the al-Qaeda leader seeks to avenge Palestinians and surely was aware of Habash's exploits, he would not be impressed by Habash's Christianity, Marxist-Leninist politics or connections to the ex-Soviet Union. It is clear, however, that the PFLP's audacious actions prompted other Palestinian factions to launch international terror campaigns of their own. Admirers of the PFLP's headline-making attacks within Yasser Arafat's mainstream Fatah group went on to plan an attack on the Olympic Games in 1972  ending in the Munich Massacre of 11 Israeli athletes and six others. What led Habash, a Christian physician  hence his nickname al-Hakim or the doctor  into such a life, of revolution, of killing? The son of a well-to-do merchant, he was trained at the American University of Beirut, the most liberal university in the Middle East then as now. His background was almost identical to that of his best friend, Wadia Haddad, the No. 2 in the PFLP and the operational genius and passionate proponent of the group's terrorist acts. When I asked Habash that question during a series of interviews many years ago, he simply told me about his personal experiences when his family lost its home during Israel's 1948 War of Independence, what the Palestinians call the Catastrophe. Habash's mother insisted he stay in Lebanon for his studies. He told me he "respected her very much. She was praying all the time. She influenced me to be merciful, kind to people, to love people, etc." When war broke out in 1948, he returned to Lydda. In July, Israeli forces led by Moshe Dayan entered Lydda and its population emptied. Israeli accounts long portrayed the Palestinians as having "fled." But Israeli historian Benny Morris wrote in 1999 that Israeli forces killed at least 250 townspeople, including young men massacred in a mosque. "Immediately after this, with [Israeli Prime Minister] Ben Gurion's authorization, the troops expelled the inhabitants of Lydda and Ramle and drove them toward the [Arab] Legion lines to the east," according to Morris. That was the horror Habash recollected as well, compounded for him by a personal tragedy: the same night, one of his sisters died in the town. Although she succumbed to typhoid, the clan blamed the Israeli onslaught for preventing her from receiving proper care. He buried the sister in the backyard, took her small children by the hand and followed the orders of the Israeli soldiers to leave. "The soldiers would say, 'All of you, out! In this direction!'" Habash recalled. "I remember asking one of the soldiers where we were supposed to go." Habash told me he rejected Christianity then. "I was all the time imagining myself as a good Christian, serving the poor. When my land was occupied, I had no time to think about religion." Habash never returned to Lydda, which, renamed Lod, became part of the State of Israel. He and Haddad spent their time volunteering medical services in the newly established Palestinian refugee camps and later formed the Arab Nationalist Movement in solidarity with Egypt's revolutionary leader, Gamal Abdul Nasser. After Nasser's humiliating defeat in the 1967 war with Israel, Palestinians broke off from the group and formed the PFLP. Habash initially sought to use terrorism to instigate a Palestinian uprising against Israel and popular revolts in Arab countries like Jordan ruled by pro-Western leaders. When I told Habash, "You were a medical doctor, yet you killed and assassinated and used volence," he did not flinch from responding. "All the time I was believing from the bottom of my heart and brain that I am fighting for a righteous cause," he said. "The Israelis took our country because they are powerful, and that is why we have to attain power, because justice without power means nothing. Certain [terrorist] operations would make Palestinians themselves feel that they can do something, which would make all the world stop and say, 'Oh, what is this?'" Four decades after Habash introduced the world to airplane hijacking, that question continues to be asked about the violent actions of Palestinians. Habash succeeded in raising awareness of their cause, yet his extreme, vengeful methods also helped drench it in blood, and likely brought Palestinians no closer to freedom and dignity.